What Is The Most Effective Office Layout for Your Team? Picturing the typical office environment likely conjures up images of fluorescent lighting, bland carpeting, and an endless sea of cubicles. While this layout may have been popular years ago, today’s businesses are reimagining work environments, testing out innovative layouts to boost productivity and profitability. The right office layout can work wonders, boosting employee morale, strengthening office relationships, and optimizing workflow. However, it may come as no surprise that no single layout is right for every unique team across businesses and industries. When considering the right office layout for your team, consider the following pros and cons of the most popular options. Let’s begin with the most widely recognized office design: cubicles. In this layout, employee desks are situated in rows or in smaller clumps, with dividing walls separating each unit. Pros. The most obvious advantage of a cubicle layout is that they offer a high level of privacy for each employee. With this design, employees can more easily maintain focus because of the limited distractions other layouts foster. Concentration is key in any work environment, however both audible and visible distractions are a reality of every office. The walls of the cubicle create a quieter work environment for each employee, minimizing the amount of noise that reaches their desk, and limiting the frequency with which nearby co-workers might attempt to engage in conversation. Additionally, cubicles offer added functionality of employees’ workspaces, giving them space to hang items such as pictures, notes, and calendar. Cons. Many of today’s businesses have moved away from the cubicle layout for a number of reasons. One of the most widely cited disadvantages of cubicles is that they make it difficult to access co-workers. Because it’s not always immediately obvious if a co-worker is that their desk or not, employees may rely on less personal and slower means of communication when brainstorming or asking questions. Another potential drawback of the cubicle design is the potential for reduced productivity. While we all get distracted from our work from time to time, there’s no denying that the presence of a supervisor passing by or the sound of co-workers hard at work have the power to snap us back into focus. With cubicles, added privacy could mean longer, unnoticed periods of time spent surfing the web or visiting social media sites on a mobile device. Who does it work for? For certain teams and businesses, cubicles make sense. For example, large organizations with teams that require some level of privacy might benefit from this layout. Telemarketing firms, where employees spend a great deal of time on the phone, might find an open layout challenging as it would get quite noisy. Banks and auditing firms might opt for cubicles in order to protect sensitive information of their clients that may be discussed over the phone. Other factors to consider are whether or not the employees of your business typically work solo or collaboratively, or if focus is more essential than creativity. 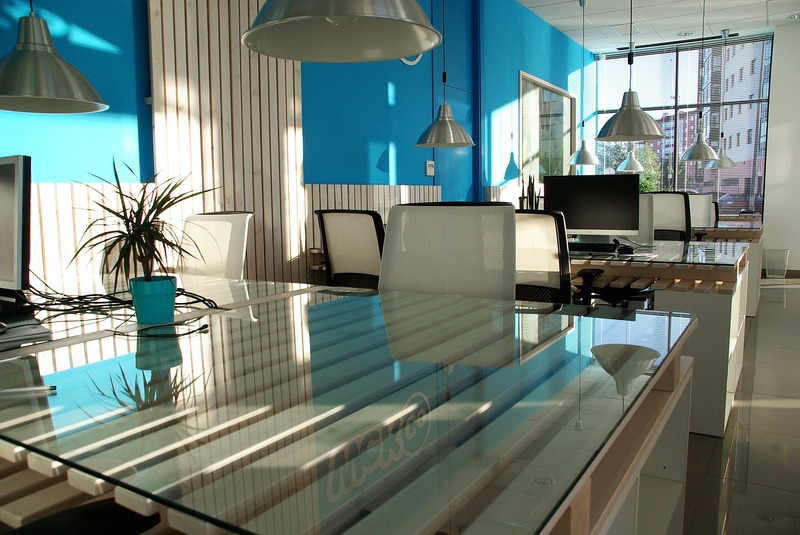 Today, companies are trending towards the open plan office layout. With this layout, there are no partitions between work spaces, with employees seated in rows or clusters in an open space. Pros. The biggest advantage to the open plan layout is the opportunity to easily communicate and collaborate with co-workers. With no dividing walls, employees are free to engage with each other for impromptu brainstorming sessions, guidance, and general check-in. With an open plan design, faster decision-making and quicker results are possible. Cons. With increased accessibility comes more opportunity for distractions. Employees might get carried away in non-work related conversations, or the sheer level of noise can make it difficult to focus on tasks. Additionally, open plan layouts that lack private rooms make it difficult to host meetings, make phone calls, or hold private conversations. Who does it work for? Fast-paced, startup companies where collaboration and creativity are valued can benefit from open plan layouts. Flat hierarchy companies, where there are no or few levels of middle management, are also drawn to open plan designs as they represent an equal footing among employees. As the name implies, the private office layout consists of separate rooms for some or all employees. Pros. One advantage of the private office layout is that employees have their own, personal space that they can organize and make their own. This freedom allows them to ensure their space meets their personal and professional needs, thereby optimizing productivity and performance. Another pro of this layout is the unmatched privacy and quietness allowing for complete focus. Cons. With the added privacy of a private office comes the potential for isolation. Employees may find that they rarely interact with co-workers, limiting their ability to collaborate, develop strong working relationships, or build comfort reaching out for thought partnership or assistance. Who does it work for? A private office layout works best for teams or businesses where employees frequently meet one-on-one with clients. Common adopters of the private office layout include professionals working in legal, medical, and realty fields. At Corporate Suites, it is our mission to help businesses small and large thrive in work environments that optimize workflow, promote networking and collaboration, and enhance focus. We offer a wide variety of fully-furnished, ready to use office space rentals in NYC, including private offices, team spaces, mini suites, coworking spaces, and more. No matter your unique needs, we have customizable options that will work for your business. Contact us today to discuss our collection of spaces, and determine which choice makes sense for you.